There's a baby on the way for Benedict Cumberbatch and Sophie Hunter! The couple is expecting their third child together, E! News has learned. During Monday evening's 2018 Emmys in Los Angeles, the 40-year-old theatre and opera director debuted a small but growing baby bump as she arrived to television's biggest event alongside her husband of three years. Sophie lit up the 70th Annual Emmy Awards' gold carpet in a bright yellow gown. The British beauty and her famous beau, who kept it simple in a classic suit, coordinated with stylish sunglasses as they posed for photographs. Benedict and Sophie's wonderful news comes just over a year after they welcomed a baby boy named Hal Auden Cumberbatch. In 2015, Hunter gave birth to son Christopher "Kit" Carlton just months after she and Cumberbatch tied the knot on Valentine's Day that year. As for tonight's festivities, Benedict is nominated for Outstanding Lead Actor in a Limited Series or Movie for his performance in Showtime's Patrick Melrose. 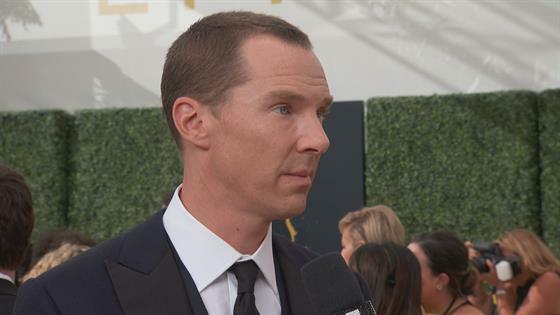 Benedict Cumberbatch Tells What Drew Him to "Patrick Melrose"
Congratulations to Benedict and Sophie, and check out even more expectant celebrities over the age of 40 in the gallery above!